The latest addition to the Award Winning Trilogy Commercial Range of Rods is this mighty atom, The TRILOGY POND WAND. 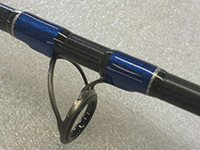 Coming in at only 6ft 6 inches and with a super lightweight of a mere 94 grams, do not under estimate this rod. Slim, Dainty and Precision made, this rod can delivery power if and when required. 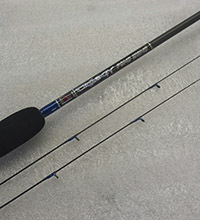 Designed for fishing the long pole line when weather conditions dictate that a pole cannot be used, or to fish just beyond your pole length, this rod is the absolute perfect tool for the job. Use it on Stillwater’s, Canals and todays modern Commercial Fisheries both in Summer and Winter. Just a gently under arm flick will allow you to drop a little feeder or bomb exactly where you want it every time. A one section rod which comes with two interchangeable Carbon Push In Tips, gives this rod no flat spots and a perfect action to cope with small silver fish , F1 Carp and should a bigger Carp come along it will progressively put on the power as you bend it into the fish. Made with the same Ultra High Grade Carbon Materials, and the very latest Superlight Ring Lock Guides from the U.S.A. as we use in all our Trilogy Commercial Range, this rod just has quality in abundance. For any angler who is serious about having the right tool for the job, this has to be an item in his holdall.